Fast-Cardio Or Slow-Cardio? The True Answer Without Exogenous Bias. I will explain why HIIT and HIT are the two best hands-down ways to get super ripped AND massive. Here I will explain in detail and without bias why cardio is so important... especially for natural competitors! Most bodybuilders cringe at the thought of cardio. There is this negative perception towards cardio because of the loss or shrinking of muscle that supposedly comes from it. Well, I have what may be a shock to many, but is the very essence of being or becoming a natural bodybuilder. I will explain why high-intensity interval training (HIIT) and high-intensity training (HIT) are the two best hands-down ways to get super ripped AND massive for a contest. Let me say that one again, MASSIVE. Contrary to common dogma about natural bodybuilding shows looking like swim meets, there is a new and up-and-coming breed of natural bodybuilders who know how to get maximally massive and lean for a contest. What I mean by maximally massive and lean is the attainment of the maximal amount of lean body mass that can be physiologically attained at the lowest possible body fat for a certain body frame, whereby physique proportions and symmetry are kept in-tact (Di Pasquale, 1992; Kouri et al., 1995). Now before I delve into this article, let me just make this clear that when competing as a natural, you have to pay a lot more attention to detail rather than relying on an expected outcome from an exogenous ergogenic source. In this landmark study by Kouri et al. (1995), it was found that the fat-free mass index (FFMI) in non-steroid users had a well-defined upper limit. However, in steroid users, this human upper limit was easily exceeded, and in some cases it was astronomically exceeded (Kouri et al., 1995). Therefore, it was concluded that perhaps this FFMI could be used to screen for possible steroid abuse in which bodybuilders may attempt to deny such behavior (Kouri et al., 1995). That day of what was referred to as swim meets is slowly dying, because of the hard-core, in-depth scientific analysis and battle-tested practices that many of these new-age natural bodybuilders are employing into their daily training regimens. This generation of natural bodybuilders who are stepping to the forefront are simply making "The Way" of competing obsolete. The Way, among many other things in this instance, refers to walking at a snail's pace or pedaling on a recumbent bike at 65 RPM expecting a totally ripped physique by the end of 10-12 weeks. Sorry to have to say, but this is the best way to lose your next contest. The best way to accomplish a maximally lean and massive physique is to simply bust your tail hitting the cardio hard. Losing body fat at the beginning of a pre-contest preparation is easy since we typically have more to lose at that stage anyway. However, when it comes to getting that last bit of fat to come off, the so-called "stubborn fat," it takes a more aggressive approach to get the job done (Dulloo et al., 1998). Our bodies have what is theoretically referred to as a set-point (Weinsier et al., 2000). Basically, the body will try everything it can to stay at a certain body weight. Well this can also occur with body fat. "How bad do I want this?" or as Pro Natural Bodybuilder Layne Norton said, "You just gotta ask yourself do I want this that bad? You gotta ask yourself, you know, am I working harder than the guy that's going to be standing next to me? And if you can't answer yes to that question, you're probably gonna get beat." Cardio intensity is like having different landlords. In order to evict the body fat, you need an assertive landlord who is not afraid of getting the job done. Lets think of the stubborn fat as a lazy tenant. In the movie The Big Lebowski, the landlord was very shy and anxious about asking for the rent. He replied, "Dude, tomorrow's already the 10th... Just slip the rent under my door." In the movie Coming to America, the landlord screamed to a lazy tenant who faked falling down the stairs, "Your rent's due ************!" Slow cardio is like the landlord from the Big Lebowski, while fast cardio is like the landlord from Coming to America. The point of this analogy was to show that in order to evict the stubborn fat, you need an aggressive and intense cardio program to get the job done. When you're natural, and not relying on pharmaceutical aids, fast cardio is what has to be done. In other words, we don't have that luxury of pedaling at 65 rpm on a bike knowing we have exogenous aids coming in on a daily basis. We have to stimulate what others get exogenously, endogenously. And there are no short-cuts to the essence of true blue-collar hard work. In fact, one study even showed that anabolic steroids aided in enhancing fat metabolism even in the absence of intense physical training (Guzman et al., 1993). Another study found that adult men not engaged in intensive resistance training were able to experience gargantuan increases in lean body mass and subsequent decreases in body fat (Forbes et al., 1992). These findings are pretty synonymous with pedaling at 65 rpm or less and/or walking at a snail's pace. Not to mention, basic science has clearly shown that fast cardio is more beneficial at burning fat than slow cardio (Puhl & Clark, 1992; Tremblay et al., 1990; Tremblay et al., 1994; Yoshioka et al., 2001). 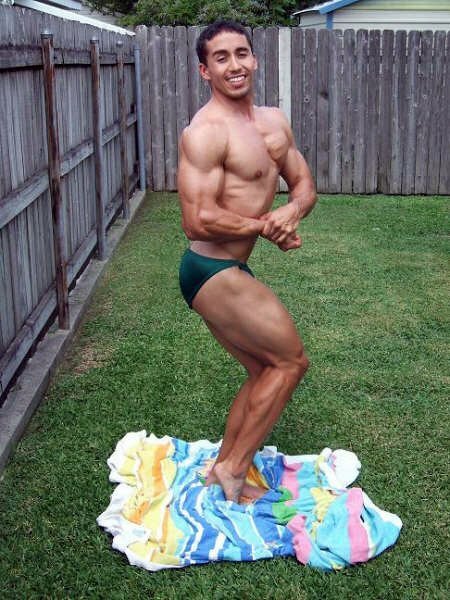 In fact, even top bodybuilding nutritionist Chris Aceto (1997) sides with fast-cardio over slow-cardio. The bottom-line is, a great body never comes easy. The sooner we get used to that fact, the better off we will be. * Approximate caloric expenditure based on metabolic equations in American College of Sports Medicine Guidelines for Exercise Testing and Prescription (4th Ed.). ** Approximate percent and amount. Adapted from Puhl & Clark (1992). As far as using diet to burn the fat off, this will only serve to encourage many to continue referring to natural shows as swim meets. On the contrary, if we burn off the fat and keep nutrition anabolic most of the time, we will make those opposed to natural shows cringe at the fact that we are respectively massive within genetic and physiological limits while staying proportionate, with the only difference being we stay within the normal human physiological upper limit for muscle mass (D'Antona et al., 2006; Di Pasquale, 1992; Kouri et al., 1995). As advocated by renowned fitness expert and natural bodybuilder, Tom Venuto, it is better to burn off fat rather than starve off fat. Oh, I almost forgot, HIIT training strips muscle away right? No, actually HIIT training stimulates growth hormone production (Goto et al., 2007; Stokes et al., 2002), lowers our respiratory exchange ratio throughout rest of the day (Maehlum et al., 1986), burns more TOTAL calories at the end of the day (Puhl & Clark, 1992), force feeds stubborn fat into action and forces the body to hold onto muscle. Let me just do everyone reading this right now a favor and impress you with solid scientific evidence supporting the following logical reasons for FAST CARDIO being KEY to getting RIPPED. Contrary to popular opinion claiming low-intensity exercise emphasizes fat usage, while high-intensity exercise only emphasizes carb usage, thus the example of the aerobics instructor in great cardiovascular condition but can't lose any body fat. This is based on the assumption that we never tap into the fat stores since all we are burning are carbs. This is now accepted as an obsolete rationalization. Aerobic instructors today know that resistance training is important, and thus many are pretty respectively ripped in their own right. More importantly, substrate usage is not as significant and isolated as once thought and here is why. Let's say we do HIIT and burn nothing but carbs, well, this lowers glycogen levels, and thus we will have to rely on fat for energy more throughout the rest of the day (Kiens & Richter, 1998; Schrauwen et al., 1997). When glycogen levels are lowered, this signals the body to mobilize and utilize fat stores (Schrauwen et al., 1998; Yoshioka et al., 2001), which is synonymous to low-carbing. Oh by the way, what happens if we eat carbs right after the HIIT workout, wouldn't this elevate glycogen levels and thus cease fat-burning??!!! Nonsense. And let me explain why. Research has clearly shown that glycogen replenishment is a top priority, and that during carb-feeding after HIIT training, the body has to continue functioning while you carb replete (Kimber et al., 2003). Well, what energy source do you think is being used while glycogen is being replenished and SPARED? You guessed it, FAT! Fat is used from the thermic effect of feeding (Young et al., 1986) and to continue feeding our natural RMR while we restock the glycogen stores (Kimber et al., 2003). Additionally, this creates an energy deficit that day, in which our body will need to make up the deficit by dipping into fat reserves, provided we eat prudently enough to sustain a negative daily caloric balance (Bennard et al., 2005). Simple science here. What happens during sprinting or HIIT training? We induce metabolic acidosis! The result of maxing out the first 2 energy systems (ATP-PC and Glycolytic systems). During the rest intervals, we are burning significant amounts of fat and at a high rate!!! Explanation: The ATP-PC system can provide high power energy for a maximum of about 10 seconds (McArdle et al., 2001). Once this time period elapses, it is still fueling energy but the glycolytic system picks up and becomes more involved as time goes on (McArdle et al., 2001). What is important about this is that the recovery time for repletion of ATP-PC takes about 30-seconds to replete 70%, and about 3-minutes to replete about 97-100% (Foss & Keteyian, 1998; Harris et al., 1976; Hultman et al., 1967). During this time of repletion, it is important to know that this rephosphorylation of ATP-PC is an OXIDATIVE process, thus the involvement of FATS in the replenishment of the ATP-PC stores (Harris et al., 1976; Tomlin & Wenger, 2001). Huh!!? Sprinting or HIIT training allows one to sustain muscle-size due to it's intensity-muscle-fiber specific nature (McArdle et al., 2001). In other words, sprinting or any other high-intensity exercise stimulate the power muscle fibers (type IIb) thus preserving their need to be existent. In fact, HIT and HIIT training actually stimulate growth hormone which supports muscle growth (Goto et al., 2007; Stokes et al., 2002) and fat-burning (Aceto, 1997). Does slow-cardio induce this kind of anabolic response? Just to elucidate any confusion, when I say fast-cardio, I am referring to cardio that is ~60-100% of age-predicted heart rate maximum. Obviously anything above 65-75% would be HIIT depending on one's fitness level and anaerobic threshold. So essentially, moderate-intensity fast-cardio is intense enough to get you sweating and exerting yourself with vigor and effort. Anything less than 60% and you are wasting your time. Also, for those who think cardio 4 to even 6 times per week will strip away muscle, this just is not scientifically-based (Manore et al., 1993) or true (Little & Wolff, 2007), provided that cardio mode and intensity are adjusted to nutritional and metabolic state. Bottom-line, even if cardio and diet are NOT done optimally, it is better to come in flat and ripped than big and smooth. Especially for natural bodybuilding shows, you will have a better chance of winning if you compete ripped and smaller than if you compete big and smooth (Hansen, 2005). However, for those who come in ripped and big as a natural, you are in a class of your own. Aceto, C. (1997). Everything you need to know about fat loss. Morris Publishing, Kearney, NE. Bennard et al. (2005). Maximizing acute fat utilization: Effects of exercise, food, and individual characteristics, Canadian Journal of Applied Physiology, 30(4), 475-499. D'Antona et al. (2006). Skeletal muscle hypertrophy and structure and function of skeletal muscle fibres in male bodybuilders, Journal of Physiology, 570(3), 611-627. Di Pasquale, (1992). Maximizing Lean Body Mass Without Drugs, Drugs in Sports, 1(3), 6-12. Dulloo & Jacquet (1998). Adaptive reduction in basal metabolic rate in response to food deprivation in humans: a role for feedback signals from fat stores, Journal of Applied Physiology, 85(2), 599-606. Forbes et al. (1992). Sequence of changes in body composition induced by testosterone and reversal of changes after drug is stopped, Journal of the American Medical Association, 267(19), 397-399. Foss & Keteyian (1998). Fox's physiological basis for exercise and sport, 6th edition, WCB-McGraw-Hill, New York, NY. Goto et al. (2007). Attenuated growth hormone response to resistance exercise with prior sprint exercise, Medicine & Science in Sports & Exercise, 39(1), 108-115. Guzman et al. (1991). Treatment with anabolic steroids increases the activity of the mitochondrial outer carnatine palmitoyltransferase in rat liver and fast twitch muscle, Biochemical Pharmacology 41(5), 833-835. Harris et al. (1976). The time course of phosphorylcreatine resynthesis during recovery of the quadriceps muscle in man, Pflugers Archiv, 367, 137-142. Hultman et al. (1967). Breakdown and resythesis of phosphorylcreatine and adenosine triphosphate in connection with muscular work in man, Scandinavian Journal of Clinical Laboratory Investigation, 19, 56-66. Kiens & Richter (1998). Utilization of skeletal muscle triglycerol during postexercise recovery in humans, American Journal of Physiology, 275(2 pt 1), E332-E337. Kimber et al. (2003). Skeletal muscle fat and carbohydrate metabolism during recovery from glycogen-depleting exercise in humans, The Journal of Physiology, 548, 919-927. Kouri et al. (1995). Fat-free mass index in users and nonusers of anabolic-androgenic steroids, Clinical Journal of Sport Medicine, 5(4), 223-228. Little & Wolff (2007). One More Rep! Lessons from the World's Biggest, Strongest, and Best Bodybuilders. McGraw-Hill Inc. New York, NY. Maehlum et al. (1986). Magnitude and duration of excess postexercise oxygen consumption in healthy young subjects, Metabolism, 35(5), 425-429. Manore et al. (1993). Diet and Exercise Strategies of a World-Class Bodybuilder, International Journal of Sport Nutrition, 3, 76-86. Puhl & Clark (1992). Exercise intensity and body fat loss, National Strength and Conditioning Association Journal, 14(6), 16-18. Schrauwen et al. (1997). Role of glycogen-lowering exercise in the change of fat oxidation in response to a high-fat diet, American Journal of Physiology, 273, E623-E629. Schrauwen et al. (1998). Fat balance in obese subjects: Role of glycogen stores, American Journal of Physiology, 274, (6 pt 1) E1027-E1033. Stokes et al. (2002). The time course of the human growth hormone response to a 6 s and a 30 s cycle ergometer sprint, Journal of Sport Sciences, 20(6), 487-494. Tomlin & Wenger (2001). The relationship between aerobic fitness and recovery from high intensity intermittent exercise, Sports Medicine, 31(1), 1-11. Tremblay et al. (1990). Effect of intensity of physical activity on body fatness and fat distribution, American Journal of Clinical Nutrition, 51, 153-157. Tremblay et al. (1994). Impact of exercise intensity on body fatness and skeletal muscle metabolism, Metabolism, 43(7), 814-818. Weinsier et al. (2000). Do adaptive changes in metabolic rate favor weight regain in weight-reduced individuals? An examination of the set-point theory. American Journal of Clinical Nutrition, 72, 1088-1094. Yoshioka et al. (2001). Impact of high intensity exercise on energy expenditure, lipid oxidation and body fatness, International Journal of Obesity, 25, 332-339. Young et al. (1986). Prior exercise potentiates the thermic effect of a carbohydrate load, Metabolism, 35 (11), 1048-1053.